columns-changed The number of columns of the treeview has changed. cursor-changed The position of the cursor (focused cell) has changed. move-cursor The Gtk.TreeView ::move-cursor signal is a keybinding signal which gets emitted when the user presses one of the cursor keys. row-activated The “row-activated” signal is emitted when the method Gtk.TreeView.row_activated() is called, when the user double clicks a treeview row with the “activate-on-single-click” property set to False, or when the user single clicks a row when the “activate-on-single-click” property set to True. row-collapsed The given row has been collapsed (child nodes are hidden). row-expanded The given row has been expanded (child nodes are shown). test-collapse-row The given row is about to be collapsed (hide its children nodes). test-expand-row The given row is about to be expanded (show its children nodes). Widget that displays any object that implements the Gtk.TreeModel interface. Bin window coordinates: Coordinates relative to the window that Gtk.TreeView renders to. Tree coordinates: Coordinates relative to the entire scrollable area of Gtk.TreeView. These coordinates start at (0, 0) for row 0 of the tree. Several functions are available for converting between the different coordinate systems. The most common translations are between widget and bin window coordinates and between bin window and tree coordinates. For the former you can use Gtk.TreeView.convert_widget_to_bin_window_coords() (and vice versa), for the latter Gtk.TreeView.convert_bin_window_to_tree_coords() (and vice versa). The Gtk.TreeView implementation of the Gtk.Buildable interface accepts Gtk.TreeViewColumn objects as <child> elements and exposes the internal Gtk.TreeSelection in UI definitions. Gtk.TreeView has a main CSS node with name treeview and style class .view. It has a subnode with name header, which is the parent for all the column header widgets’ CSS nodes. For rubberband selection, a subnode with name rubberband is used. A newly created Gtk.TreeView widget. Creates a new Gtk.TreeView widget. Creates a new Gtk.TreeView widget with the model initialized to model . column (Gtk.TreeViewColumn) – The Gtk.TreeViewColumn to add. The number of columns in self after appending. Appends column to the list of columns. If self has “fixed_height” mode enabled, then column must have its “sizing” property set to be Gtk.TreeViewColumnSizing.FIXED. Recursively collapses all visible, expanded nodes in self . Converts bin_window coordinates (see Gtk.TreeView.get_bin_window()) to widget relative coordinates. Converts widget coordinates to coordinates for the bin_window (see Gtk.TreeView.get_bin_window()). Creates a cairo.Surface representation of the row at path . This image is used for a drag icon. Turns self into a drop destination for automatic DND. Calling this method sets Gtk.TreeView :reorderable to False. Turns self into a drag source for automatic DND. Calling this method sets Gtk.TreeView :reorderable to False. Recursively expands all nodes in the self . path (Gtk.TreePath) – path to a row. Gets the setting set by Gtk.TreeView.set_activate_on_single_click(). Fills the bounding rectangle in bin_window coordinates for the cell at the row specified by path and the column specified by column . If path is None, or points to a node not found in the tree, the y and height fields of the rectangle will be filled with 0. If column is None, the x and width fields will be filled with 0. The returned rectangle is equivalent to the background_area passed to Gtk.CellRenderer.render(). These background areas tile to cover the entire bin window. Contrast with the cell_area , returned by Gtk.TreeView.get_cell_area(), which returns only the cell itself, excluding surrounding borders and the tree expander area. A Gdk.Window, or None when self hasn’t been realized yet. Returns the window that self renders to. This is used primarily to compare to event->window to confirm that the event on self is on the right window. Fills the bounding rectangle in bin_window coordinates for the cell at the row specified by path and the column specified by column . If path is None, or points to a path not currently displayed, the y and height fields of the rectangle will be filled with 0. If column is None, the x and width fields will be filled with 0. The sum of all cell rects does not cover the entire tree; there are extra pixels in between rows, for example. The returned rectangle is equivalent to the cell_area passed to Gtk.CellRenderer.render(). This function is only valid if self is realized. n (int) – The position of the column, counting from 0. The Gtk.TreeViewColumn, or None if the position is outside the range of columns. Gets the Gtk.TreeViewColumn at the given position in the #tree_view. Returns a GLib.List of all the Gtk.TreeViewColumn s currently in self . The returned list must be freed with g_list_free (). Fills in path and focus_column with the current path and focus column. If the cursor isn’t currently set, then path will be None. If no column currently has focus, then focus_column will be None. The returned Gtk.TreePath must be freed with Gtk.TreePath.free() when you are done with it. Determines the destination row for a given position. drag_x and drag_y are expected to be in widget coordinates. This function is only meaningful if self is realized. Therefore this function will always return None if self is not realized or does not have a model. Return location for the path of the highlighted row, or None. True if tree lines are drawn in self , False otherwise. Returns whether or not tree lines are drawn in self . Returns whether fixed height mode is turned on for self . a Gtk.TreeViewGridLines value indicating which grid lines are enabled. Returns which grid lines are enabled in self . A Gtk.Adjustment object, or None if none is currently being used. Gets the Gtk.Adjustment currently being used for the horizontal aspect. Returns True if the headers on the self are visible. Returns whether hover expansion mode is turned on for self . Returns whether hover selection mode is turned on for self . the amount of extra indentation for child levels in self . A return value of 0 means that this feature is disabled. Returns the amount, in pixels, of extra indentation for child levels in self . Returns the model the Gtk.TreeView is based on. Returns None if the model is unset. Queries the number of columns in the given self . x (int) – The x position to be identified (relative to bin_window). y (int) – The y position to be identified (relative to bin_window). Finds the path at the point ( x , y ), relative to bin_window coordinates (please see Gtk.TreeView.get_bin_window()). That is, x and y are relative to an events coordinates. x and y must come from an event on the self only where event->window == gtk_tree_view_get_bin_window (). It is primarily for things like popup menus. If path is non-None, then it will be filled with the Gtk.TreePath at that point. This path should be freed with Gtk.TreePath.free(). If column is non-None, then it will be filled with the column at that point. cell_x and cell_y return the coordinates relative to the cell background (i.e. the background_area passed to Gtk.CellRenderer.render()). This function is only meaningful if self is realized. Therefore this function will always return False if self is not realized or does not have a model. For converting widget coordinates (eg. the ones you get from Gtk.Widget ::query-tooltip), please see Gtk.TreeView.convert_widget_to_bin_window_coords(). Retrieves whether the user can reorder the tree via drag-and-drop. See Gtk.TreeView.set_reorderable(). True if rubber banding in self is enabled. Returns whether rubber banding is turned on for self . If the selection mode is Gtk.SelectionMode.MULTIPLE, rubber banding will allow the user to select multiple rows by dragging the mouse. Gets the setting set by Gtk.TreeView.set_rules_hint(). Returns the Gtk.Entry which is currently in use as interactive search entry for self . In case the built-in entry is being used, None will be returned. Gets the Gtk.TreeSelection associated with self . True if expanders are drawn in self , False otherwise. Returns whether or not expanders are drawn in self . This function is supposed to be used in a Gtk.Widget ::query-tooltip signal handler for Gtk.TreeView. The x , y and keyboard_tip values which are received in the signal handler, should be passed to this function without modification. The return value indicates whether there is a tree view row at the given coordinates (True) or not (False) for mouse tooltips. For keyboard tooltips the row returned will be the cursor row. When True, then any of model , path and iter which have been provided will be set to point to that row and the corresponding model. x and y will always be converted to be relative to self ’s bin_window if keyboard_tooltip is False. Gets the Gtk.Adjustment currently being used for the vertical aspect. Returns the first and last visible path. Note that there may be invisible paths in between. Fills visible_rect with the currently-visible region of the buffer, in tree coordinates. Convert to bin_window coordinates with Gtk.TreeView.convert_tree_to_bin_window_coords(). Tree coordinates start at 0,0 for row 0 of the tree, and cover the entire scrollable area of the tree. column (Gtk.TreeViewColumn) – The Gtk.TreeViewColumn to be inserted. position (int) – The position to insert column in. The number of columns in self after insertion. This inserts the column into the self at position . If position is -1, then the column is inserted at the end. If self has “fixed_height” mode enabled, then column must have its “sizing” property set to be Gtk.TreeViewColumnSizing.FIXED. Creates a new Gtk.TreeViewColumn and inserts it into the self at position . If position is -1, then the newly created column is inserted at the end. The column is initialized with the attributes given. If self has “fixed_height” mode enabled, then the new column will have its sizing property set to be Gtk.TreeViewColumnSizing.FIXED. Convenience function that inserts a new column into the Gtk.TreeView with the given cell renderer and a Gtk.TreeCellDataFunc to set cell renderer attributes (normally using data from the model). See also Gtk.TreeViewColumn.set_cell_data_func(), Gtk.TreeViewColumn.pack_start(). If self has “fixed_height” mode enabled, then the new column will have its “sizing” property set to be Gtk.TreeViewColumnSizing.FIXED. Determine whether the point ( x , y ) in self is blank, that is no cell content nor an expander arrow is drawn at the location. If so, the location can be considered as the background. You might wish to take special action on clicks on the background, such as clearing a current selection, having a custom context menu or starting rubber banding. The x and y coordinate that are provided must be relative to bin_window coordinates. That is, x and y must come from an event on self where event->window == gtk_tree_view_get_bin_window (). The path , column , cell_x and cell_y arguments will be filled in likewise as for Gtk.TreeView.get_path_at_pos(). Please see Gtk.TreeView.get_path_at_pos() for more information. True if a rubber banding operation is currently being done in self . Returns whether a rubber banding operation is currently being done in self . data (object or None) – User data to be passed to the function. column (Gtk.TreeViewColumn) – The Gtk.TreeViewColumn to be moved. base_column (Gtk.TreeViewColumn or None) – The Gtk.TreeViewColumn to be moved relative to, or None. Moves column to be after to base_column . If base_column is None, then column is placed in the first position. column (Gtk.TreeViewColumn) – The Gtk.TreeViewColumn to remove. The number of columns in self after removing. Removes column from self . path (Gtk.TreePath) – The Gtk.TreePath to be activated. column (Gtk.TreeViewColumn) – The Gtk.TreeViewColumn to be activated. path (Gtk.TreePath) – A Gtk.TreePath to test expansion state. True if #path is expanded. Returns True if the node pointed to by path is expanded in self . path (Gtk.TreePath or None) – The path of the row to move to, or None. column (Gtk.TreeViewColumn or None) – The Gtk.TreeViewColumn to move horizontally to, or None. row_align (float) – The vertical alignment of the row specified by path . col_align (float) – The horizontal alignment of the column specified by column . Moves the alignments of self to the position specified by column and path . If column is None, then no horizontal scrolling occurs. Likewise, if path is None no vertical scrolling occurs. At a minimum, one of column or path need to be non-None. row_align determines where the row is placed, and col_align determines where column is placed. Both are expected to be between 0.0 and 1.0. 0.0 means left/top alignment, 1.0 means right/bottom alignment, 0.5 means center. Scrolls the tree view such that the top-left corner of the visible area is tree_x , tree_y , where tree_x and tree_y are specified in tree coordinates. The self must be realized before this function is called. If it isn’t, you probably want to be using Gtk.TreeView.scroll_to_cell(). Cause the Gtk.TreeView ::row-activated signal to be emitted on a single click instead of a double click. func (Gtk.TreeViewColumnDropFunc or None) – A function to determine which columns are reorderable, or None. Sets a user function for determining where a column may be dropped when dragged. This function is called on every column pair in turn at the beginning of a column drag to determine where a drop can take place. The arguments passed to func are: the self , the Gtk.TreeViewColumn being dragged, the two Gtk.TreeViewColumn s determining the drop spot, and user_data . If either of the Gtk.TreeViewColumn arguments for the drop spot are None, then they indicate an edge. If func is set to be None, then self reverts to the default behavior of allowing all columns to be dropped everywhere. Sets the current keyboard focus to be at path , and selects it. This is useful when you want to focus the user’s attention on a particular row. If focus_column is not None, then focus is given to the column specified by it. Additionally, if focus_column is specified, and start_editing is True, then editing should be started in the specified cell. This function is often followed by gtk_widget_grab_focus ( self ) in order to give keyboard focus to the widget. Please note that editing can only happen when the widget is realized. Sets the current keyboard focus to be at path , and selects it. This is useful when you want to focus the user’s attention on a particular row. If focus_column is not None, then focus is given to the column specified by it. If focus_column and focus_cell are not None, and focus_column contains 2 or more editable or activatable cells, then focus is given to the cell specified by focus_cell . Additionally, if focus_column is specified, and start_editing is True, then editing should be started in the specified cell. This function is often followed by gtk_widget_grab_focus ( self ) in order to give keyboard focus to the widget. Please note that editing can only happen when the widget is realized. Deprecated since version 3.4: Accessibility does not need the function anymore. Sets the row that is highlighted for feedback. If path is None, an existing highlight is removed. If enable_search is set, then the user can type in text to search through the tree interactively (this is sometimes called “typeahead find”). enabled (bool) – True to enable tree line drawing, False otherwise. Sets whether to draw lines interconnecting the expanders in self . This does not have any visible effects for lists. column (Gtk.TreeViewColumn or None) – None, or the column to draw the expander arrow at. Sets the column to draw the expander arrow at. It must be in self . If column is None, then the expander arrow is always at the first visible column. Enables or disables the fixed height mode of self . Fixed height mode speeds up Gtk.TreeView by assuming that all rows have the same height. Only enable this option if all rows are the same height and all columns are of type Gtk.TreeViewColumnSizing.FIXED. grid_lines (Gtk.TreeViewGridLines) – a Gtk.TreeViewGridLines value indicating which grid lines to enable. Sets which grid lines to draw in self . Sets the Gtk.Adjustment for the current horizontal aspect. setting (bool) – True if the columns are clickable. Enables or disables the hover expansion mode of self . Hover expansion makes rows expand or collapse if the pointer moves over them. Enables or disables the hover selection mode of self . Hover selection makes the selected row follow the pointer. Currently, this works only for the selection modes Gtk.SelectionMode.SINGLE and Gtk.SelectionMode.BROWSE. indentation (int) – the amount, in pixels, of extra indentation in self . Sets the amount of extra indentation for child levels to use in self in addition to the default indentation. The value should be specified in pixels, a value of 0 disables this feature and in this case only the default indentation will be used. This does not have any visible effects for lists. Sets the model for a Gtk.TreeView. If the self already has a model set, it will remove it before setting the new model. If model is None, then it will unset the old model. reorderable (bool) – True, if the tree can be reordered. This function is a convenience function to allow you to reorder models that support the Gtk.TreeDragSourceIface and the Gtk.TreeDragDestIface. Both Gtk.TreeStore and Gtk.ListStore support these. If reorderable is True, then the user can reorder the model by dragging and dropping rows. The developer can listen to these changes by connecting to the model’s Gtk.TreeModel ::row-inserted and Gtk.TreeModel ::row-deleted signals. The reordering is implemented by setting up the tree view as a drag source and destination. Therefore, drag and drop can not be used in a reorderable view for any other purpose. Enables or disables rubber banding in self . If the selection mode is Gtk.SelectionMode.MULTIPLE, rubber banding will allow the user to select multiple rows by dragging the mouse. Sets a hint for the theme to draw even/odd rows in the self with different colors, also known as “zebra striping”. Sets the entry which the interactive search code will use for this self . This is useful when you want to provide a search entry in our interface at all time at a fixed position. Passing None for entry will make the interactive search code use the built-in popup entry again. Sets the compare function for the interactive search capabilities; note that somewhat like strcmp() returning 0 for equality Gtk.TreeViewSearchEqualFunc returns False on matches. enabled (bool) – True to enable expander drawing, False otherwise. Sets whether to draw and enable expanders and indent child rows in self . When disabled there will be no expanders visible in trees and there will be no way to expand and collapse rows by default. Also note that hiding the expanders will disable the default indentation. You can set a custom indentation in this case using Gtk.TreeView.set_level_indentation(). This does not have any visible effects for lists. Sets the tip area of tooltip to the area path , column and cell have in common. For example if path is None and column is set, the tip area will be set to the full area covered by column . See also Gtk.Tooltip.set_tip_area(). See also Gtk.TreeView.set_tooltip_column() for a simpler alternative. If you only plan to have simple (text-only) tooltips on full rows, you can use this function to have Gtk.TreeView handle these automatically for you. column should be set to the column in self ’s model containing the tooltip texts, or -1 to disable this feature. Sets the tip area of tooltip to be the area covered by the row at path . See also Gtk.TreeView.set_tooltip_column() for a simpler alternative. See also Gtk.Tooltip.set_tip_area(). Sets the Gtk.Adjustment for the current vertical aspect. Undoes the effect of Gtk.TreeView.enable_model_drag_dest(). Calling this method sets Gtk.TreeView :reorderable to False. Undoes the effect of Gtk.TreeView.enable_model_drag_source(). Calling this method sets Gtk.TreeView :reorderable to False. step (Gtk.MovementStep) – the granularity of the move, as a Gtk.MovementStep. Gtk.MovementStep.LOGICAL_POSITIONS, Gtk.MovementStep.VISUAL_POSITIONS, Gtk.MovementStep.DISPLAY_LINES, Gtk.MovementStep.PAGES and Gtk.MovementStep.BUFFER_ENDS are supported. Gtk.MovementStep.LOGICAL_POSITIONS and Gtk.MovementStep.VISUAL_POSITIONS are treated identically. direction (int) – the direction to move: +1 to move forwards; -1 to move backwards. The resulting movement is undefined for all other values. The Gtk.TreeView ::move-cursor signal is a keybinding signal which gets emitted when the user presses one of the cursor keys. Applications should not connect to it, but may emit it with g_signal_emit_by_name() if they need to control the cursor programmatically. In contrast to Gtk.TreeView.set_cursor() and Gtk.TreeView.set_cursor_on_cell() when moving horizontally Gtk.TreeView ::move-cursor does not reset the current selection. The “row-activated” signal is emitted when the method Gtk.TreeView.row_activated() is called, when the user double clicks a treeview row with the “activate-on-single-click” property set to False, or when the user single clicks a row when the “activate-on-single-click” property set to True. It is also emitted when a non-editable row is selected and one of the keys: Space, Shift+Space, Return or Enter is pressed. 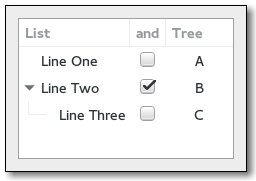 For selection handling refer to the tree widget conceptual overview as well as Gtk.TreeSelection. The activate-on-single-click property specifies whether the “row-activated” signal will be emitted after a single click. Setting the ::fixed-height-mode property to True speeds up Gtk.TreeView by assuming that all rows have the same height. Only enable this option if all rows are the same height. Please see Gtk.TreeView.set_fixed_height_mode() for more information on this option. This mode is primarily intended for treeviews in popups, e.g. in Gtk.ComboBox or Gtk.EntryCompletion. Enables or disables the hover selection mode of tree_view . Hover selection makes the selected row follow the pointer. Currently, this works only for the selection modes Gtk.SelectionMode.SINGLE and Gtk.SelectionMode.BROWSE.